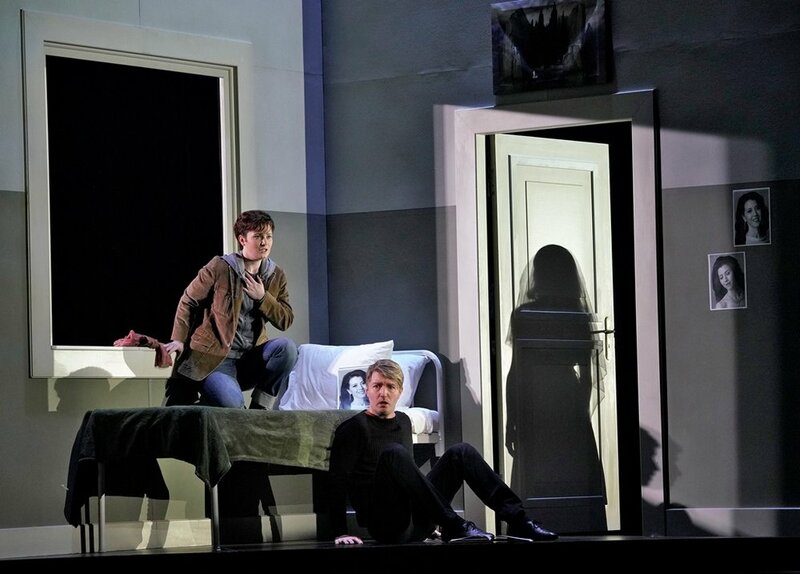 LA Opera has staged the Gluck opera twice in 1990 and 2003 in the original Italian version. This new 2018 co-production with the Lyric Opera of Chicago and the Joffrey Ballet is the rarely heard 1776 Paris version, featuring the “Dance of the Blessed Spirits” (Act II), and a greatly expanded Act III finale with a new trio, a final chorus and three new dances. The mezzo-soprano Orpheus in the Italian version is now a very high haute-contre French tenor. Gluck might be a reformer of the opera seria, but he’s also a practical man of the theater. He prefaces the death of Eurydice with a happy, upbeat, life-affirming overture and ends the opera in a ‘love triumphant’ song and dance. He wants his audience to leave the opera house happy and content like the two protagonists (except in this production, where Eurydice does not come back to life but instead lives forever in Orpheus’ heart). This “Orpheus” is a balletomane’s dream. Not only does it feature the Joffrey Ballet, but the singers are asked to play dancers -- Orpheus as a choreographer, Eurydice as his prima ballerina wife, Amor as his assistant. The dancers of the Joffrey Ballet skillfully combine the classical and modern ballet in the many dance numbers. The “Dance of the Blessed Spirits” is a display of grace, lightness and poetry in motion; while the “Dance of the Furies” and the Act III finale contain thrilling energy and ferocity of modern dance. Does the ballet further the drama and plot of the opera? Yes, for the most part. 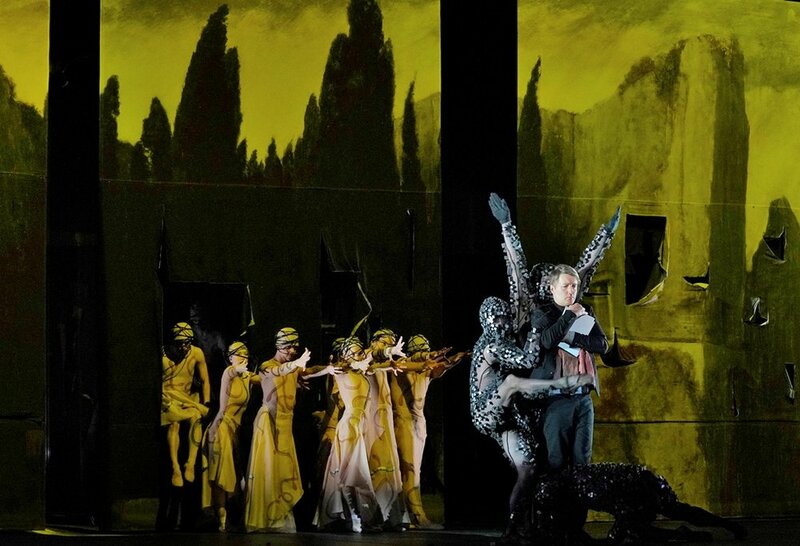 During the overture, the choreography shows a squabbling couple, Eurydice’s death (in a car accident), and a grief-stricken Orpheus, seamlessly leading to the opening funereal chorus – a brilliant brainchild of John Neumeier, who also directed the singers, designed the costumes and sets inspired by Arnold Böcklin’s painting ‘Isle of the Dead’. Neumeier is known for successfully melding the ballet with different genres of music and new interpretations of the classics, including this new “Orpheus”. As Orpheus (aka choreographer), tenor Maxim Mironov sang valiantly, spinning some sweet high notes in his Act II aria "Laissez-vous toucher" that softened the Furies enough to let him pass into Elysium. His Act III aria "J’ai perdu mon Eurydice" ("What will I do without Eurydice?”) featured singing of great poignancy and classical refinement. Soprano Lisette Oropesa’s Eurydice (aka ballerina) managed a few leaps and port de bras like a trouper but really shone in her radiant singing in Act II and floated some gorgeous high notes above the trio in Act III. As Amor (aka ballet assistant), soprano Liv Redpath employed her darker hues with great warmth and feeling. The invisible Los Angeles Opera Chorus was ensconced in the orchestra pit behind the musicians but contributed mightily to the drama with its powerfully incisive singing. The orchestra under maestro James Conlon played like the gods all night long, most memorably in the ethereally beautiful flute solo from the “Dance of the Blessed Spirit”. The Joffrey Ballet will also perform Romeo and Juliet at the Music Center March 11, 17 in a new production set in Mussolini-era 1930s Italy.